For people who live around the Monterey Bay, October marks the annual return of the migrating monarch butterfly (Danaus plexippus). Flying west and south at a distance of nearly 100 miles a day, these winged beauties travel to California, the Gulf Coast, and Mexico to overwinter and lay eggs for next year's migration. Very few sanctuaries remain for these delicate creatures. The Monarch Trail at Natural Bridges State Park, however, is one of the West Coast's best locations to see them in action. Butterflies are among the only species that take multiple generations to migrate from one location to the next. Monarchs can take up to five generations to complete the journey from their winter to summer homes and back. That means the butterflies returning to overwinter are completing a journey that their great-great grandparents started the year before. As winter comes to an end and spring emerges, the temperatures becomes more suitable for the long journey. These butterflies depend on these warmer climates because monarchs are not able to move if the temperature drops below 60 degrees. This is why you see them in clusters, or roosts, on hanging branches when it is cold. By huddling together, their collective body heat keeps them from freezing to death. Not only is this a way to keep warm, it is also a defense mechanism for the colony. The lackluster underside of their wings gives the appearance of dried, dead leaves, making it harder for predators to spot them. When the sun comes back out, their wings open up and act like miniature solar panels, warming their bodies. Once they warm up, the sky explodes with orange as thousands of monarchs take flight. Monarchs mate in midair and tumble tangled together to the ground. The female will store the received sperm until she is ready to lay her eggs. One by one she will fertilize her eggs and place them on a single milkweed leaf as she flies around. A single female monarch butterfly can lay up to 400 eggs. Monarchs rely on the toxic properties of this plant to ward away predators. Monarch caterpillar hatchlings feed on the leaves of this plant. As they grow, the toxin stays with them into adulthood, making them a not-so-tasty meal for most. 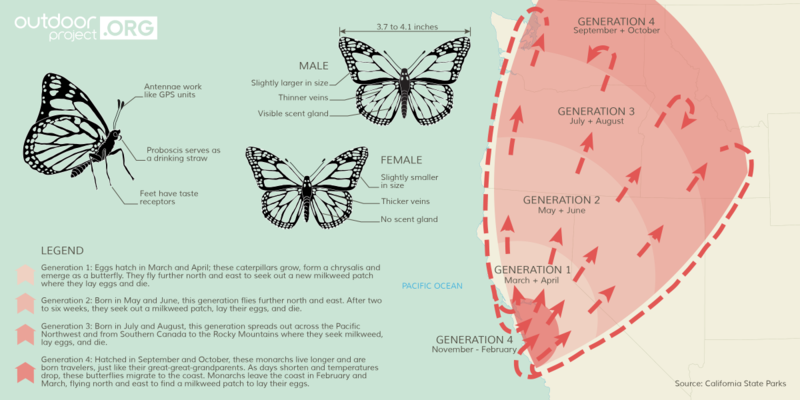 Butterflies leaving their overwinter birth locations are born in March and start the long journey back east. These butterflies will only live a few months until they reach the next leg of the journey. Here they will mate yet again, then die as the next generation continues the journey. This happens a few times until sometime after August. The fourth or fifth generation will then be born and live upwards of nine months. The reason for the longevity is to allow for the migratory journey back to their overwinter sanctuary, where they can live out the winter months and produce offspring for the spring cycle. The monarch butterflies that inhabit the western United States tend to stay to the west of the Rocky Mountains during the summer months and travel south to California or down to the Baja area of Mexico for winter. Midwestern and southern states see them during the spring as they move north toward Canada for the summer. Most of them find their way to Mexico and some to Florida during the winter. Scientists have recently discovered an “internal GPS” built into the antenna of these butterflies, and it is shedding light on how other insects might navigate long distances. The antenna, in conjunction with the position of the sun, tells the butterfly its overall position and direction. This keeps them in alignment during their migratory path. While the monarch butterfly is not an endangered species, the critical habitats that the butterflies seek for refuge certainly are. Places such as Natural Bridges and Lighthouse Field State Parks have designated protection sites, but these are few and far between. Once suitable areas for breeding and wintering are now unfit habitats, and the butterflies are forced to seek out other locations. It has been estimated that a third of monarch breeding grounds have disappeared in the last two decades, which has caused a population decrease of around 90 percent. In the 1990s, an average count of 1 billion butterflies was normal. This year, only around 35 million have been recorded. According to the Center for Biological Diversity, "Genetically engineered crops are the major driver in population crash." Urban growth, pesticides, the changing climate, and dwindling milkweed supply all are playing a role in their demise as well. Recently, a petition to add the monarch butterfly into the Endangered Species Act was filed. Political acts and community support are just the beginning of what needs to be done to bring them back to their former glory. Here are a few ways you can help the Monarch butterfly. Build a butterfly sanctuary: The most impactful thing you can do is to create a butterfly sanctuary with plenty of milkweed. Including this life-critical plant, along with pollen-bearing flowers, in your garden will help ensure they have a safe place to lay their eggs. This will also help pollinate other plants as well. A simple Google search will tell you what plants work best in your area for attracting butterflies. Forest Stewardship Council Certified: If you are buying furniture or wood products from Mexico, look for the FSC label indicating the product is from a forest that has been certified sustainable by the Forest Stewardship Council. Illegal deforestation has led to the decline of valuable overwintering grounds. Buy organic: Herbicides and pesticides not only harm butterflies, but they affect a whole range of biodiversity. A trip to Natural Bridges came up with some excellent Monarch shots.